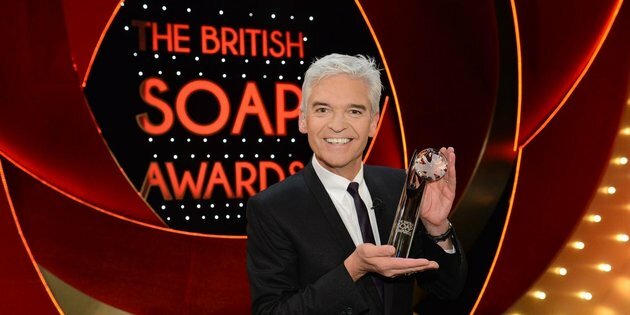 The first thing to report about the 2016 British Soap Awards was how slick Philip Schofield was as the host. If you've ever seen anything filmed before, you know that it can often go on a bit. But Schofield was amazingly slick and polished and the filming of the awards ceremony itself, which was held at Hackney Empire in London, was pretty much done and dusted in about two hours. Two of the biggest winners of the evening were Lacey Turner, who plays Stacey Fower in EastEnders, and Danny Miller, who plays Aaron Dingle in Emmerdale. Lacey's a very good actress and one of the most recognisable faces on British TV and she's been good in Enders this year, with a sometimes bizarre but emotionally high-voltage story about her character suffering post-partum psychosis. She picked up two awards for Best Actress and Best Dramatic Performance Female and her mental health story also won the Best Storyline gong. Danny Miller is a real fan favourite and his character's harrowing story about childhood abuse saw Miller pick up the Best Dramatic Performance Male and Best Actor gongs. Their awards were probably deserved and the fact that the panel votes were echoed in the public votes probably means there's some sort of across-the-board consensus. I think Jeremy Sheffield, who was excellent as Motor Neurone Disease sufferer Patrick Blake in Hollyoaks, and Rhakee Thakrar, who played Shabnam Masood in EastEnders, would also have been incredibly worthy winners, too. Two awards that I was delighted by were the victories for Doctors for the Best Single Episode for their 3000th episode, The Heart of England, which saw the conclusion of their Treehouse storyline. This was quietly brilliant and managed to combine child abuse, a shooting and police corruption on a small-budget daytime soap. An amazing feat. Ruby O'Donell also won Best Young Actor for her role as dilemma-struck teen mum Peri Lomax in Hollyoaks. I'm watching a lot more Hollyoaks at the moment and it's generally pretty good and can sometimes be excellent. My favourite character in it, however, is Nico Blake, the deranged and damaged daughter of Sienna Blake. She's quite compelling and there's something of the night about her character. The award that cheered me the most, however, was the gong for best soap. This went to Emmerdale and it was thoroughly deserved. The show has consistently been one of the best things on British TV in the last 18 months and it was a worthy victor. Its executive producer, Kate Oates, has now moved across the Pennines to run Coronation Street and I expect Corrie, whose excellent live episode went criminally unrewarded, will be back gunning for the big one next year. I hope so. I genuinely love Corrie.